Be bold in the dreams that you dream for yourself. Success at least my vision of success is always changing and evolving. When I discovered this quote by a favorite spiritual being I felt I had to share it with everyone. How many times do we get stuck in the misguided concept that you have to get to the end to start again and only by getting to the end do we succeed? Boring. By changing the vision and adding and deleting things as life pulls you along is the thrill of life. I guess when you do not think this way it is what people refer to as feeling dead inside. Death while living should never be your goal. Shine bright everyone. Botanical watercolor painting of woodland flowers is an original illustration nature art of pink hollyhocks, purple larkspur,blue delphinium flowers. 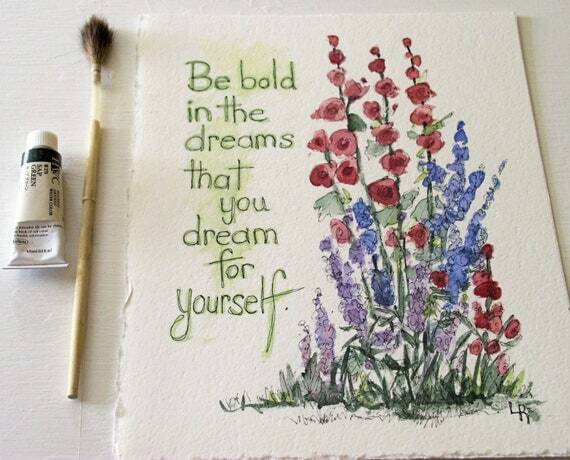 A saying ‘ Be bold in the dreams that you dream for yourself’ is original botanical garden artwork by Laurie Rohner. Wall art with inspiring words and sayings sharing my hope and possibility for a great life. Image and Paper size is 8″ x 10″. My nature art is original one-of-a-kind paintings that are suitable for framing. The artwork you will receive is hand-painted and has its own unique and individual qualities. I wrap each painting in recycled brown wrap. This painting is mailed in a first class mailer. Your painting is safely packed and shipped via Priority Mail. Shop at Between The Weeds at Etsy or at Laurie Rohner Studio. 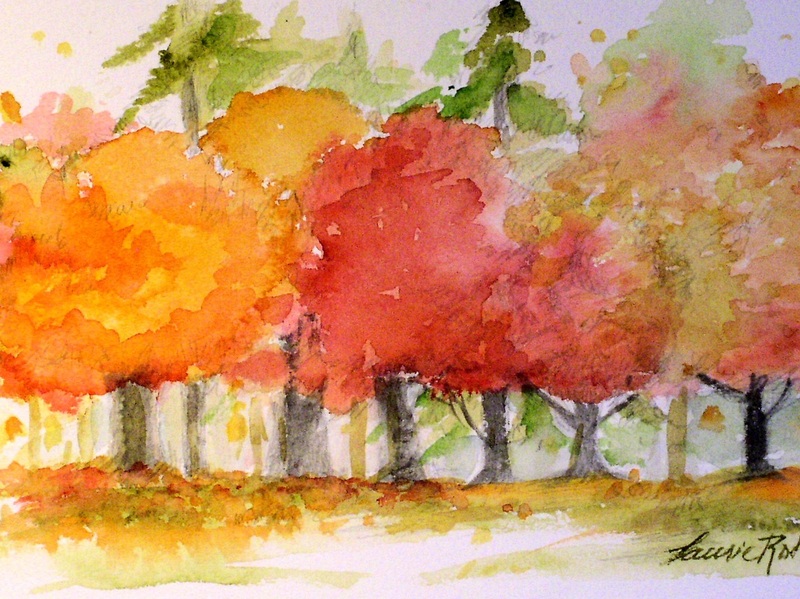 Nature Art woodland landscape rendering of autumn leaves is a watercolor original paintings on paper by Laurie Rohner. A watercolor painting of bright maple leaves in orange and reds takes me to a memory of an autumn day in Vermont. I was blessed with a beautiful view and could sit in a comfy chair one day and take in the vibrant energy of nature. Enjoying it with the best person I knew was even better. Nature seemed to have a lot to say that day. Not to stop and listen would have been an offensive move on my part. I was given so much that day that now years later I still feel the energy of that miraculous day. 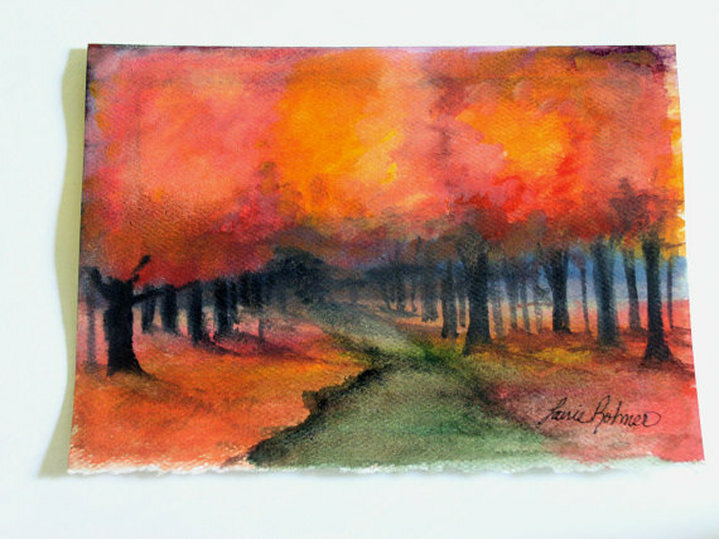 Nature landscape watercolor original art work is a painting of autumn maple trees in vivid red and orange titled Autumn Maples by Laurie Rohner.Nature art landscape in full intense color is sketched with a pencil and watercolor added to create this vibrant original watercolor landscape. The image is both fun and whimsical asking you do you see the autumn wind blowing through the trees making the leaves dance in the air? 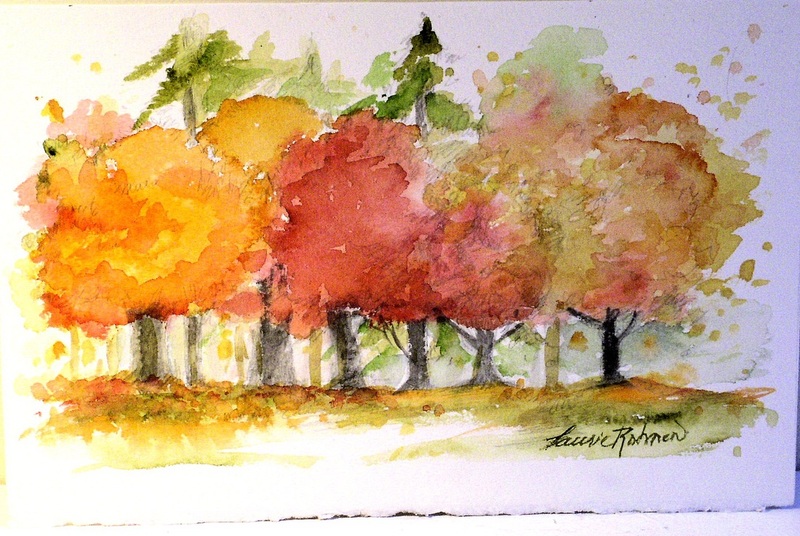 Buy art, original watercolor nature art, inspired by autumn and nature, use as wall art. Original art for sale online here at Laurie Rohner Studio. You will love my individually hand-painted art work. Great for gift giving. Can be framed later. Sale includes the one signed art work only – additional cards, frame, mat etc. are not included in sale. My nature art work is original one-of-a-kind paintings that are suitable for framing. The watercolor art you will receive has its own unique and each quality only an original watercolor can give. This is an original watercolor painting not a print or reproduction. I combine drawing with pencil and watercolor painting, then with ink. All of my watercolors are made with the finest archival quality materials – Arches Watercolor Paper and Windsor and Newton Artists Quality Watercolors – and professionally packaged to arrive safely.Windsor and Newton Artist Quality Watercolors are renowned for their superior color permanence, balance and amazing color range. This art ships to the USA at no charge. Charges will not appear on final bill. Always dream and shoot higher. I have added watercolor cards to my studio. There a bunches of cards printed of artists paintings but I wanted to offer something a bit more personal. I am combining graphite (pencil) drawings with watercolor on Strathmore art cards for an affordable price point of $10 and I ship them to you in the USA at no charge. I think they are a great way of sending someone or giving someone a beautiful handmade one of a kind painting which can be framed later. That is awesome…right? Nature landscape watercolor original art work is a painting of night time falling on autumn maple trees. A landscape of nature in full intense color is sketched with a pencil and watercolor added to create this vibrant original watercolor landscape. The image is both mystical and haunting asking you where does the path lead you. I combine drawing with pencil and watercolor painting, then with ink. 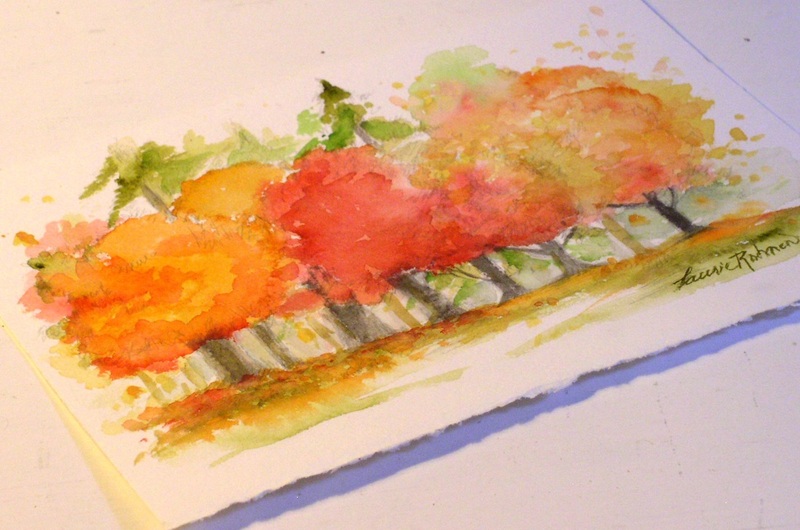 Original watercolor nature art card, inspired by autumn and nature, use as wall art. 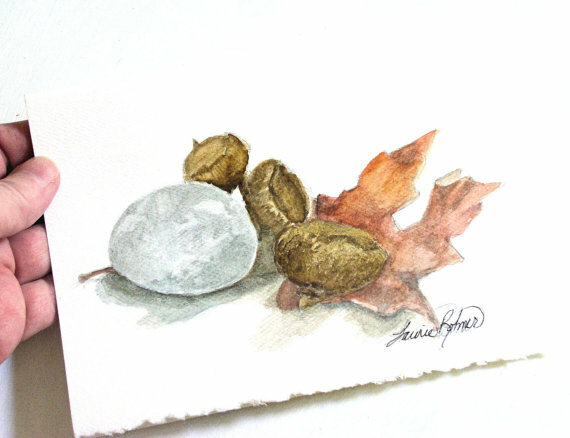 Watercolor autumn still life of found things in nature is sketched with a pencil and watercolor added to create this soft original watercolor still life. I used a river stone, a cluster of acorns and a red oak leaf for this art card. Artwork Title: Autumn Still Life. 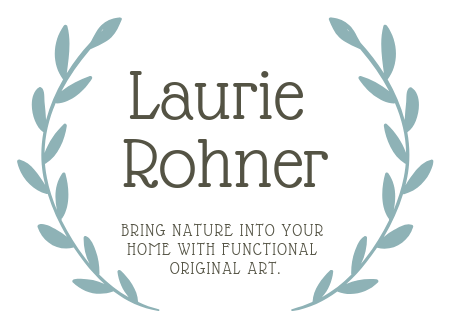 Buy original art, Original art for sale online here at Laurie Rohner Studio. You will love my individually hand-painted art cards. Great for gift giving. Can be framed later. Sale includes the one signed art card only – additional cards, frame, mat etc. are not included in sale. My nature art cards are original one-of-a-kind paintings that are suitable for framing. The card you will receive is very similar to the ones shown in this listing but may have some variations as each card is hand-painted and has its own unique and individual qualities. All of my watercolors are made with the finest archival quality materials – Strathmore Watercolor Paper and Windsor and Newton Artists Quality Watercolors – and professionally packaged to arrive safely. $10. This card ships to the USA at no charge.